For 1972, the Commission Sportive Internationale (CSI) changed the Makes rules, basically rendering the 917 obsolete for Group 5 Sports Cars. 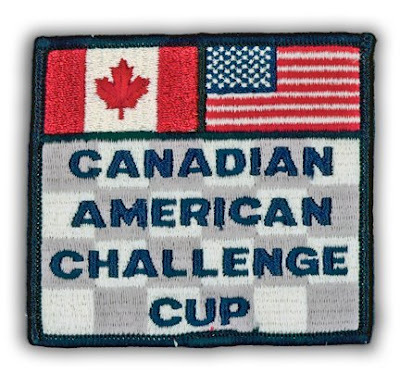 At the time, Porsche was also involved with the Can-Am Challenge, having decided to re-purpose their racer to this end, and raise their growing profile in the North American market. They created a new light-weight spyder body for the car and re-christened it the 917-10. At the time, they were also experimenting with engine turbo-charging, giving the car 850 bhp. The new car, fielded by Penske Racing, was initially driven by Mark Donohue, but a testing accident sidelined him for the season. Driving duties were then taken up by George Follmer, who successfully broke McLaren Racing’s five-year dominance of the series, and won the Championship. For 1973, Roger Penske and Mark Donohue redesigned the 917-10, giving a longer wheelbase, a more aerodynamic body, and a much more powerful twin-turbo-charged engine … 5.4-liters, 12 cylinders, 1250 bhp’s worth! The resulting top speed was 414 km/h (257 mph)! The Penske Sunoco Porsche 917-30 was unstoppable, with the Donohue-driven car winning six out of the 8 races, and taking the Championship. 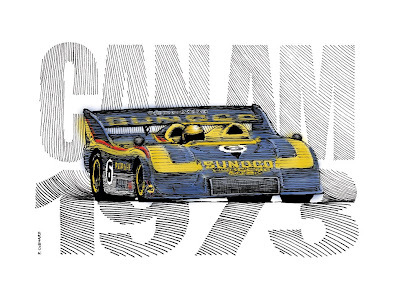 For 1974, the fuel-consumption rule-change, and the dwindling interest in Can-Am basically killed the series as it was, and the Porsche 917-30. 80 cm x 37 cm, autographed by Muller, 1974. The 917-30 found a renewed purpose in the European-based Interserie. In the hands of Swiss driver Herbert Müller, it was the winner of the 1974 Championship.